This week, Beast Coast returned with a new track, and now the hip-hop supergroup featuring Flatbush Zombies, Pro Era and the Underachievers have announced a full-fledged North American tour. 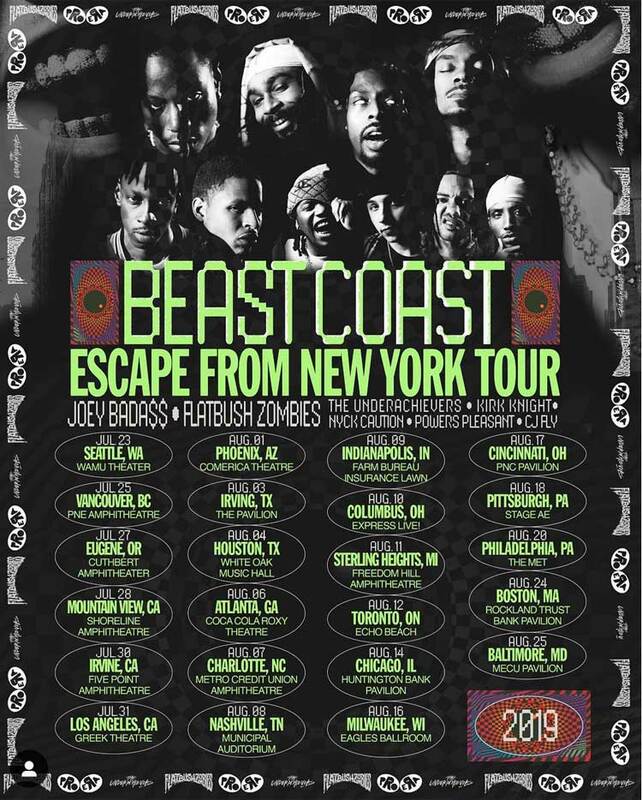 Today NYC collective announced their "Beast Coast: Escape from New York Tour." The trek across the continent will feature Flatbush Zombies, the Underachievers and Pro Era members Joey Bada$$, Kirk Knight, Nyck Caution, CJ Fly and Powers Pleasant. The trek follows their first "Beast Coast Tour," which went down back in 2013. The 27-city tour will officially kick off in Seattle on July 23 and make its way to various U.S. cities. In addition, it will hit up Canada for shows in Vancouver on July 25 and Toronto on August 12. You can see the full schedule below. General tickets go on sale Friday (March 15). As for the new Beast Coast track, it's called "Left Hand," and you can check it out below all those tour dates.